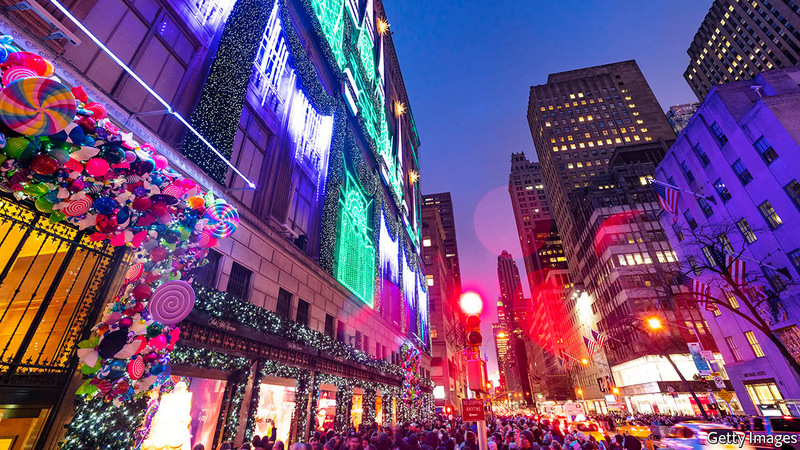 FIFTH AVENUE in New York is the most expensive stretch of retail property in the world, now festooned with lights in the approach to Christmas. The pavements heave with crowds eager to see the diamonds sparkling at Tiffany & Co, a jeweller, and festive displays at Saks Fifth Avenue, a department store. But storefronts further downtown in once-thriving shopping districts remain vacant. The global retail property business is having to adapt as consumers spend more online. Consolidation is in vogue. On December 12th two retail property companies, France’s Unibail-Rodamco and Australia’s Westfield, agreed to merge in a deal worth $24.7bn to form the world’s second-biggest owner of shopping malls by market value. Westfield earns about 70% of its revenues from property holdings in America.